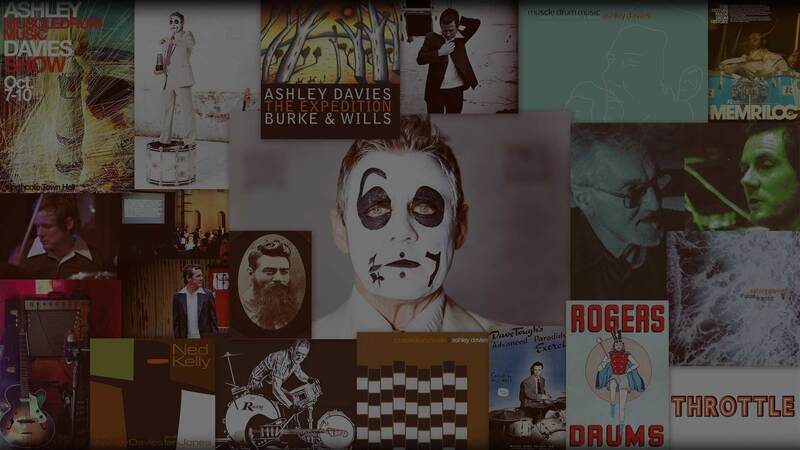 Ash is regarded as one of Australia’s most innovative and finest drummer/composers. Throughout a career spanning three decades, Davies has covered many miles of rich musical terrain and clocked up a dazzling score of credits to his name. As a composer and arranger he has self recorded and produced 6 solo albums of mostly instrumental music and conceived 3 live theatre shows incorporating his own compositions. He has written soundtracks for films by Melbourne documentary filmmaker Bayden Findlay and had songs recorded by well-known Australian artists Mia Dyson and Matt Walker. With Matt Walker he won an ARIA award and as a drummer who is able to adapt to many styles of drumming Davies has just completed session drumming duties for seasons 1 to 4 of the TV series please like me by Josh Thomas and the major motion picture release A Month of Sundays (directed by Matthew SaVille). He has recorded, toured, and played live with some of Australia’s great and other well-known artists including Jeff Lang, Chris Whitley (U.S.A.), Ben Waters (England – best boogie woogie pianist Boisdale Music Festival 2016) Jordie Lane, Rosie Flores (U.S.A.), The Dingoes (ARIA hall of fame), Lisa Miller, Rob Snarski, Chris Wilson and The Crown of Thorns to name a few.